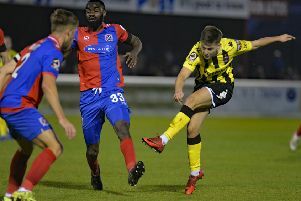 AFC Fylde boss Dave Challinor insists his side aren’t getting ahead of themselves as they gear up for tomorrow’s FA Cup second round replay at Wigan Athletic. The Coasters earned a credible 1-1 draw against the League One leaders at Mill Farm 11 days ago and travel to the DW Stadium to determine which of them reaches the third round. The winners will face Premier League Bournemouth in the New Year. Fylde have never faced a top-flight club in a competitive match but Challinor is refusing to take his eye off the job in hand. Challinor said: “We have a big task in front of us but one which we are looking forward to and we go there with nothing to lose. “We will have to be right at it to get anything and get that bit of luck, but fingers crossed we can cause an upset. “The first game confirmed what we already knew. They are a very good side who are difficult to play against. “We have to try to stay in the game, like we did at Mill Farm, but ultimately we have to put pressure on them. “Ninety minutes is a long time, especially against a side who keep the ball as well as they do. There will be occasions where we will have to be disciplined and accept they are going to have the ball. “Yes, the draw has pitted us against a Premier League club but we aren’t looking any further ahead just yet because we still have this mammoth test ahead. “We are solely focused on this game and we are going to give it our very best shot. It is a big chance for our lads to show what they can do on the big stage. “It’s a big occasion at a great stadium and it’s another opportunity to come up against very good players. “These occasions are the reason why you play football. You can take them for granted at times but they can be few and far between at this level, so you have to cherish them. “We have taken some belief from the first game and proved that we can compete against clubs much higher up the pyramid than ourselves. Fylde will be forced into at least three changes to the side which lost bythe only goal at Boreham Wood on Saturday. Luke Burke is ineligible to face his parent club, while Andy Mangan is cup-tied and George Edmundson has picked up a one-match ban after being booked at the weekend. However, Jack Muldoon is available, having been suspended for the original tie.